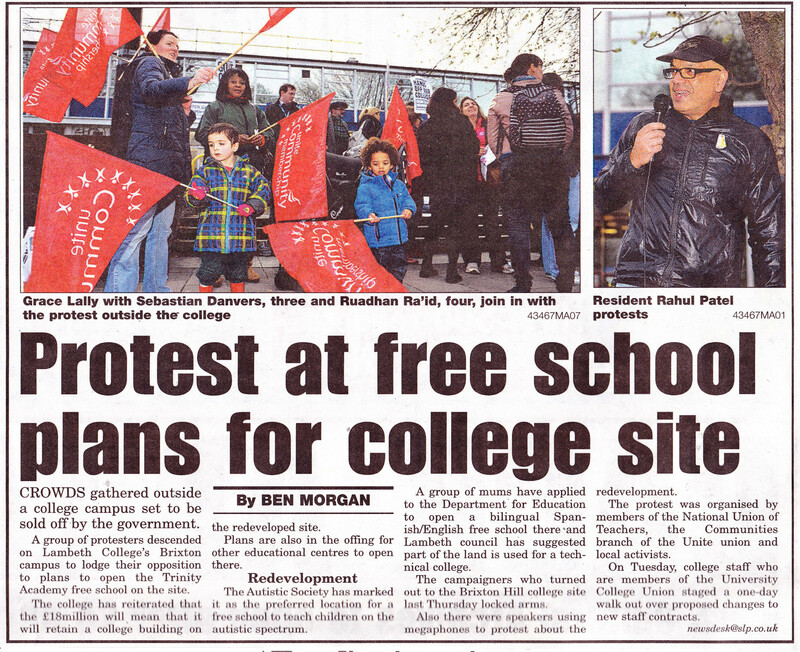 Thanks to all who attended the Save Brixton College protest. Over one hundred people attended and we got a write up almost immediately on the Brixton Blog and in the Brixton Buzz. The coverage in the South London Press took longer coming, but they did cover the demonstration in the paper that came out of Friday 4th April. Sunday 23rd March – Leafletting outside churches. Times to be confirmed, please check this space for details. Thursday 27th March 5pm to 7pm – Protest, surround Lambeth College – Brixton Centre of Lambeth College, 56 Brixton Hill, SW2 1QS. 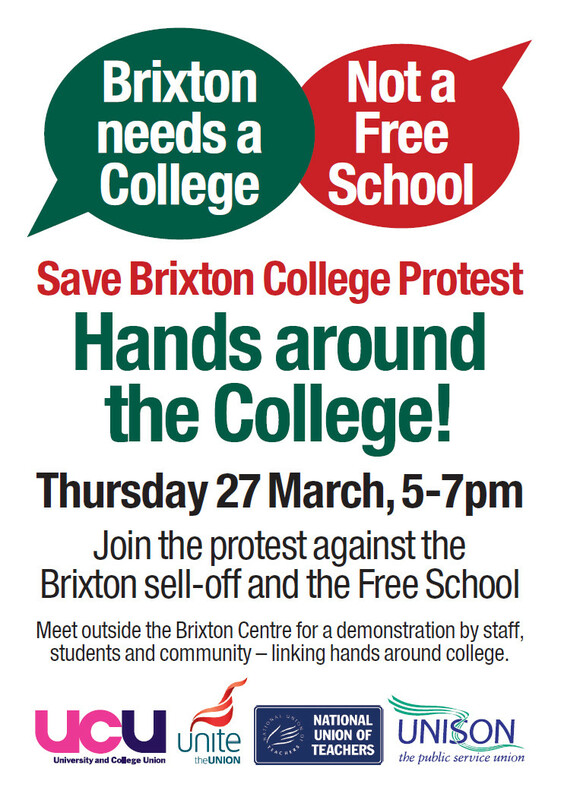 Join the protest against the Brixton sell-off and the Free School. Meet outside the Brixton Centre for a demonstration by staff, students and community linking hands around college. Obviously this letter is only one part of a much bigger campaign. Please also sign the petition to Save Lambeth College in Brixton and come to Lambeth NUT‘s Education Question Time this Thursday. There’s currently a proposal to build a free school with a catholic ethos on the site currently occupied by Lambeth College in Brixton. There’s a consultation meeting this Wednesday on whether or not this is a good idea. 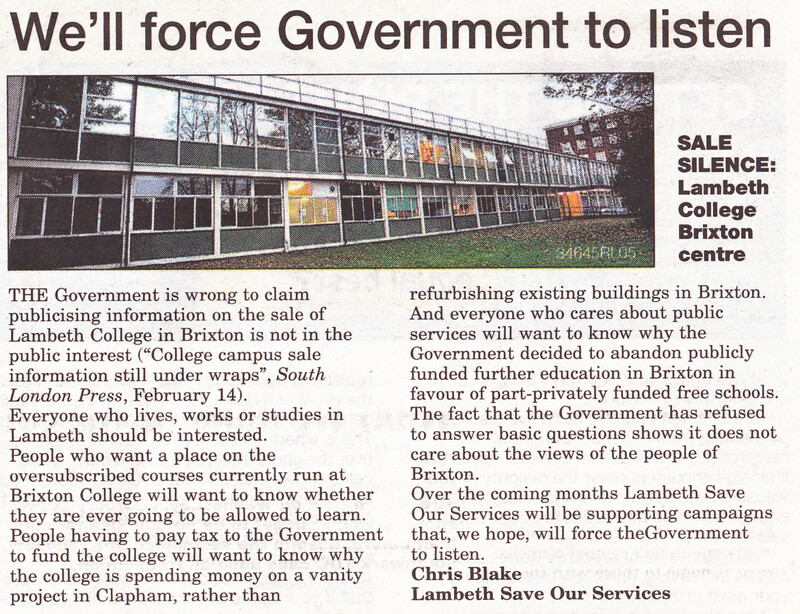 Lambeth NUT and Save Lambeth College in Brixton are encouraging everyone to go to argue it is a bad idea. Lambeth SOS supports this campaign. Free Schools are independent schools with state funding. Any “suitable sponsor” can apply to the Secretary of State for Education for approval to open a free school including private businesses, academy chains, parents, teachers, other schools, universities and faith groups. Free schools do not need local authority support to open and, despite the shortage of primary places in many parts of the country, many secondary free schools have been approved to open in areas with surplus places. Why does everyone who wants to keep Brixton College open need to turn out in force to the lobby of the council on Wednesday, 20th November? Because the result of our lobby to the governor’s meeting was highly inconclusive. 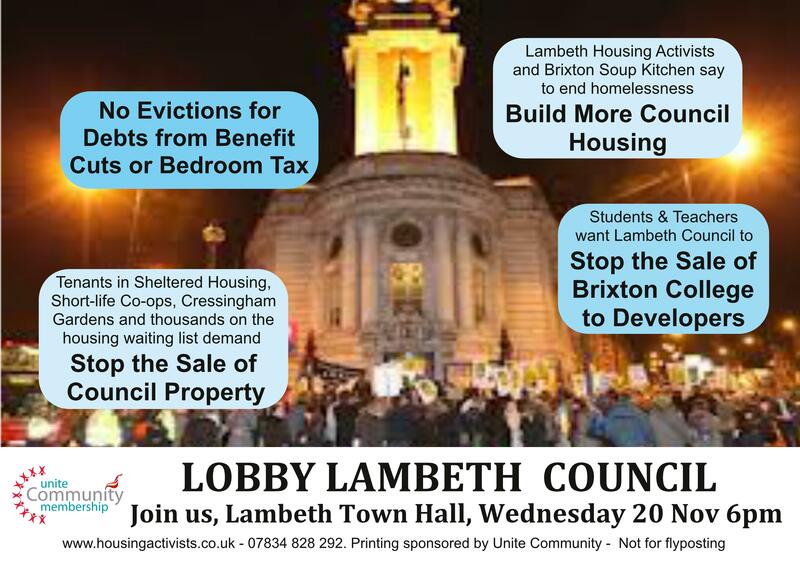 So we will be meeting at Rush Common (in front of the Brixton campus) at 5 pm and marching to City Hall to join the housing lobbies at 6 pm, because it’s all austerity. Last night the Save Lambeth College in Brixton campaign — staff, community members and students — attended the Lambeth college governor’s meeting to try and find out just what the board of governors is planning to do with the Brixton campus. Asked to leave the warm and spacious building itself, I for one was a little unprepared for just how cold it would be waiting for a report back from the two representatives of the group whom they did allow to address the board. We oppose the sale of the Brixton Centre, Lambeth College to property developers. We call on the College to keep using the whole site for community education and to secure the funds to rebuild the centre. Our demand at this point was primarily for transparency, and community hearings where the board can inform the community of their plans for the campus and hear back from the community. We asked that governor’s announce this right away, but they said very little though a sale is certainly being contemplated. The president seemed to be waiting to see what happened at the city council lobby, and appeared to think they had the support of local MPs. We clearly need to put the pressure on. And above all? Join the lobby of City Hall on Wednesday, the 20th of November to fight for our community’s rights to education and housing.